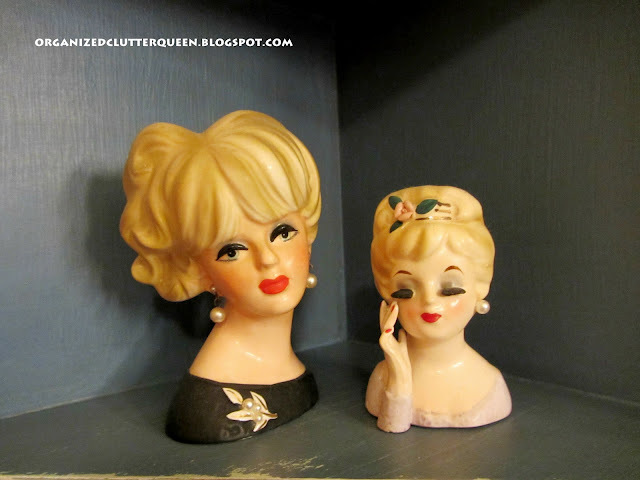 Portions of this post are a re-posted from blog entry on my vintage bathroom. 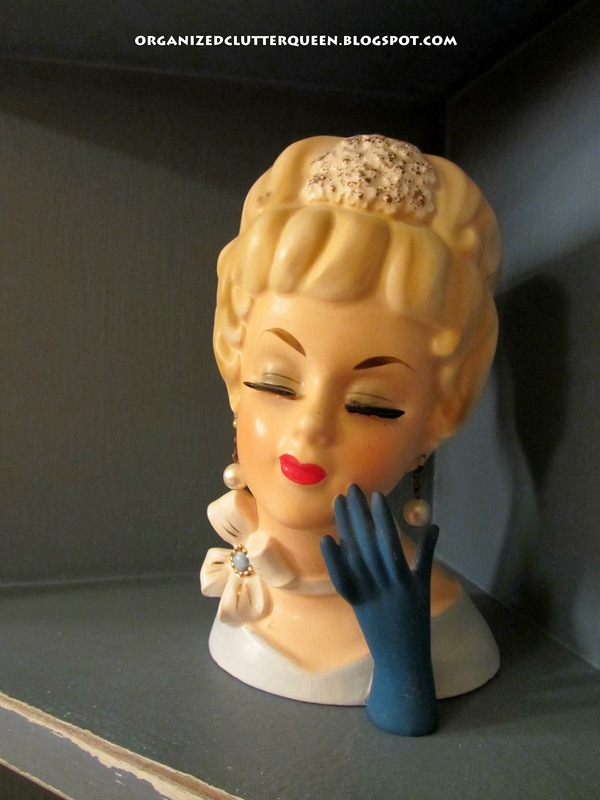 If you aren't a collector of head vases, maybe you don't get my fascination with them. They are a very popular collectible, and if you don't believe me, check it out on ebay. Head vases are not cheap. 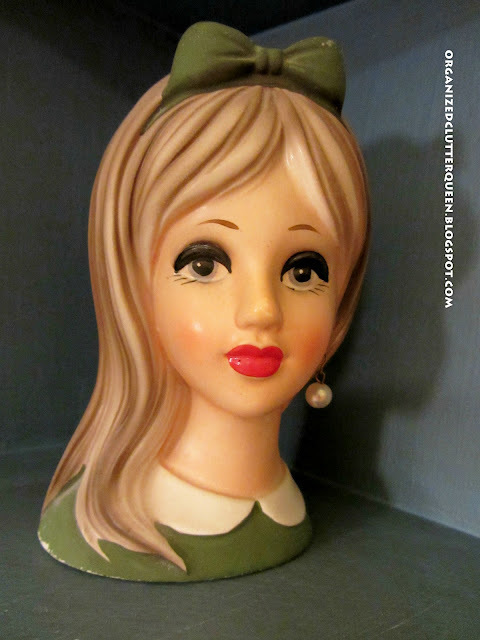 A mass produced, originally very low priced, figural vase from the 1940's - 1960's, were used primarily by florists. 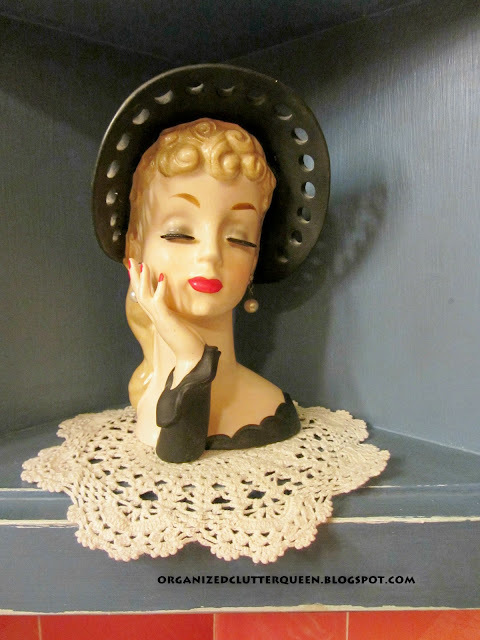 Head vases can be sophisticated, quirky, innocent, you name it. Some are holiday themed. They have been reproduced, but I can spot a reproduction quite easily. My favorites are the sophisticates. 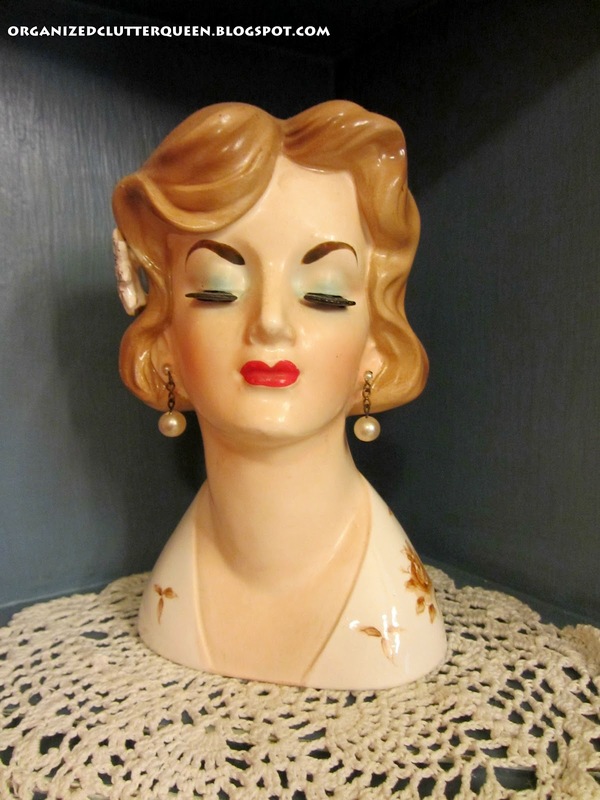 Closed eyes, with emphasis on the eyelashes and high style. My most expensive and favorite head vase by Napco Ware. Approximately $100 on ebay. She is a teeny-bopper by Napco. She has a Japan Wreath mark. She was purchased on ebay but was reasonable. She has the eyelashes and the eyebrows goin' on. The lady head vase on the left is made by Napco and the one on the right is made by Inarco. Both from ebay, reasonably priced but small. 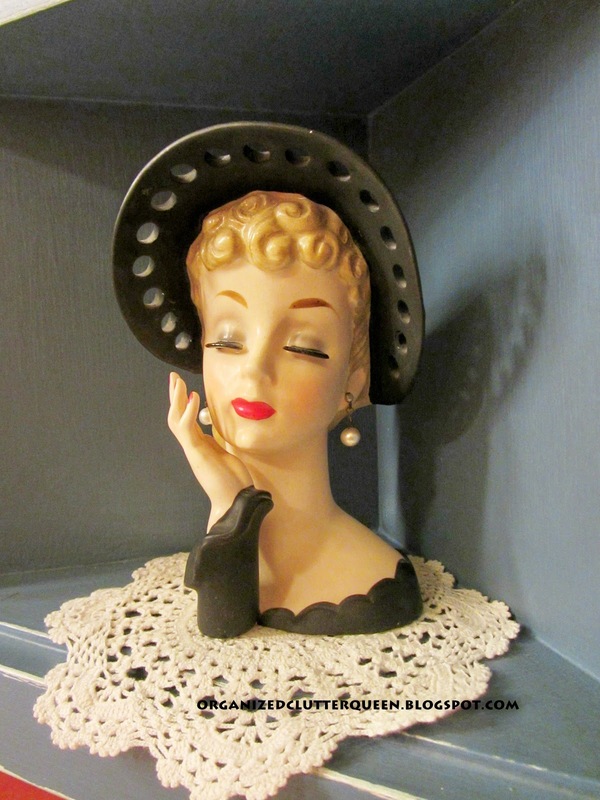 This is another favorite by Enesco. This one was Great Grandma's. She looks more like a Southern Belle. 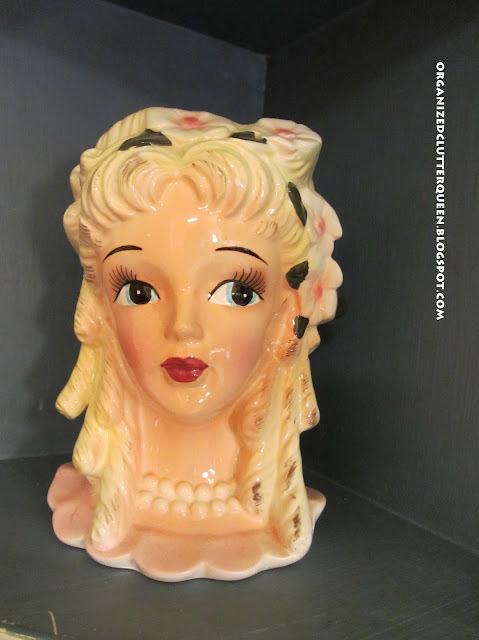 Lady head vases are a collectible that I will always love. 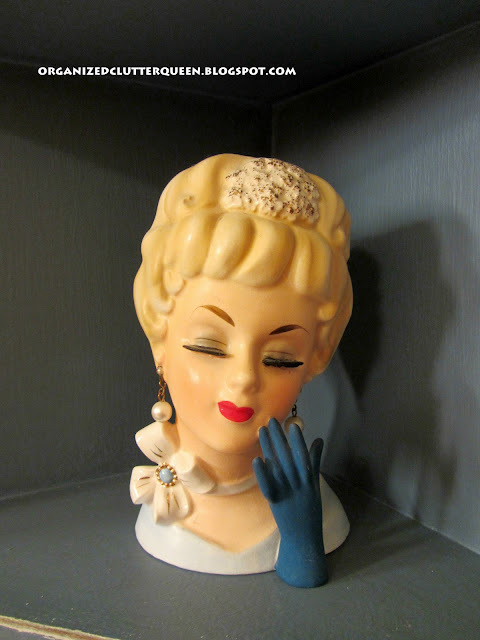 How I wish I'd started collecting the head vases years ago when they were cheap. 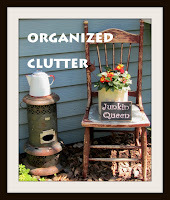 I do love them--but only have three--an aunt's, my Mom's, and my Grandmother's. You have such a wonderful collection--I'm almost envious! I still remember a photo from Kitty Barthalomew's home in which she had a shelf filled with head vases runing around the perimeter of a bedroom. Can you imagine the value of her collection?! You've got a nice collection yourself! You have some different head vases that I've never seen before! I remember my mom having a few of these when I was a kid. No idea whatever happened to them though. You just have EVERYTHING, don't you?! I'm enamored by these, especially the ones with the closed eyes. So glamorous! 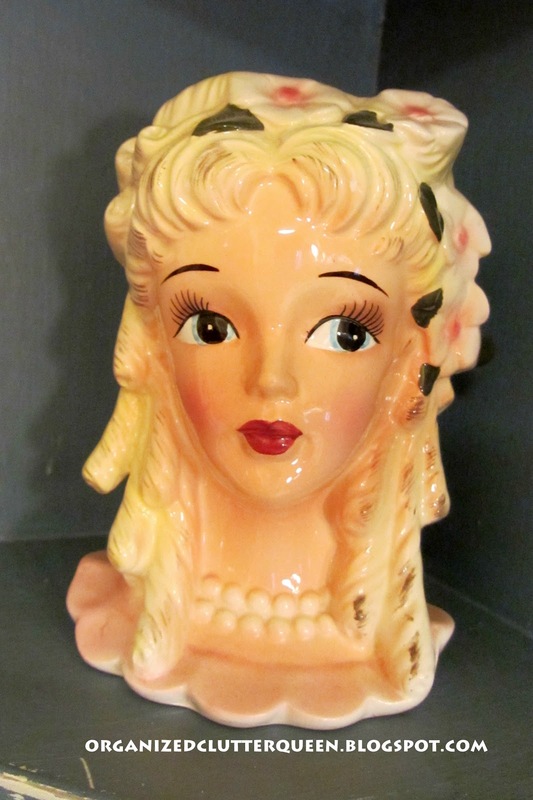 What a coincidence - I just posted today about my friend Mary's tea party she gave m e for my birthday, and SHE too collects head vases- the only one I know who does. That's funny, love them, they look awesome. I dont' have any but I sure enjoy looking at yours. You have some collection. They are so much fun with their different details.